When we look at the Moon, we see these amazing variations of light and dark. And depending on your orientation on Earth, you might see the famous “Man in the Moon”, or maybe the “Rabbit in the Moon”. The darker areas are known as maria, smooth lava fields created by ancient volcanic eruptions on the Moon. But why do we see this face of the Moon, and not a different side? The Moon’s rotation is tidally locked to the Earth. This means that the Moon always presents the same side to us, completing one orbit around the Earth in the exact same amount of time it takes to turn once on its axis. 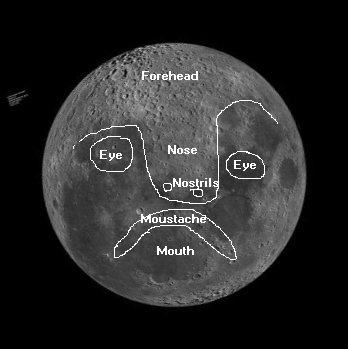 From our perspective, the Moon never rotates, always displaying the “Man in the Moon”. And before the space age, it was assumed that the entire Moon looked like this. When the first spacecraft were sent from Earth to orbit the Moon, they sent back surprising photographs that revealed a completely different landscape from what we’re used to. Instead of the dark splotches of lunar maria we see on the near side – the “Man in the Moon” – the far side is merely covered in craters. So why is the maria-side facing us, while the crater-side faces away? Is it just a coincidence? Researchers from the California Institute of Technology think that it’s not about luck at all, but the way the Moon’s rotation slowed down after its formation. Oded Aharonson, a professor of planetary science at Caltech, and his team created a simulation that calculated how the rotation of the Moon slowed down after its formation. Although the Moon looks like a sphere, it actually has a slight bulge. And billions of years ago, when the Moon was rotating much more quickly, showing its entire surface to the inhabitants of Earth, the Earth’s gravity tugged at this bulge with each rotation, slowing it down slightly each time until the Moon’s rotation was completely stopped from our perspective. In every simulation that the Caltech did, thanks to the orientation of this lunar bulge, either the Moon’s maria-side or crater-side ended up facing Earth. But the rate at which it slowed down – how fast it dissipated its rotational energy – defined our chances of seeing the “Man in the Moon”. If the Moon slowed down quickly, it would have been a 50/50 chance. But because the Moon slowed down more gradually, we had a much higher chance of seeing the maria-side as the final result. The maria-side was twice as likely to be our final view over the crater-side. The results of this research was published in the February 27th edition of the Journal Icarus. You can read a more detailed article from the Caltech news release. The reason why is the earth’s gravity pulls the volcanism just as it bulges the moon. Volcanoes since the moon synchronized would happen on the earth side. “Although the moon looks spherical, it is actually elongated, almost like a football. Not long after the moon formed just over four billion years ago, while it was still hot and largely molten, Earth’s gravity began to stretch its new companion. When the moon cooled, its slightly oblong shape stuck. Today, the man in the moon occupies one of the two elongated ends. Eventually, however, Earth’s pull on the moon slowed down its rotation through a dissipative process first explained by Goldreich in the 1960s. Tidal forces tugged on the moon, creating another slight bulge—in addition to the moon’s already-elongated shape—that moved to stay on whichever side was closest to Earth at that moment. The bulge continued to point toward Earth as the moon rotated through it, causing the moon’s interior to squish and flex as the bulge changed position. The internal friction from this flexing acted as a brake that slowed the moon’s spinning until its rotation rate matched its revolution rate, when it settled into a synchronous orbit. Volcanoes would face the outside in your scenario. I still fail to see a face or man in the moon.